Viper Odino uses bearings not washers. Thanks for catching, that Ramin. Looking at the knife it appears as if it is on washers, but you are absolutely right. Explains why this thing is so damn smooth. I have updated the review accordingly. I’ve been considering this knife for some time but you’ve highlighted an interesting issue I had when looking at it. In the fourth picture above your index finger is in the groove placing it about an inch away from the cutting surface. You wrote that you found yourself “choking up quite a bit on the ricasso, although the default grip sets you back on the handle a bit.” I understand this picture to illustrate the default grip, so, assuming my assumption is correct, does this mean you placed your index finger on the section of the handle between the groove and the cutting edge and your middle finger in the grooxe? How did that work out? Excellent question. Yes, when I choke up on the knife my fingers are exactly as you describe. It works well. That area between the cutting edge and finger choil is more than enough room for my index finger and the grip is very natural feeling. I can’t speak for Vox but I am confident that was the intention of his design. Another fine review – thanks, Dan. The Italians seem to specialize in really beautiful designs and this one is right up there. It screams wantability! At this price, it should have a steel insert. And the TI version is a bit chunky for me to pocket-EDC. I hope Odino finds a way to slim down its forthcoming flipper version. Thank you, Michael. I agree, the full titanium Odino is pretty hefty. This one has been on my “want” list for a while. I found your comments about the grip really interesting and they answered some things I was wondering about the ergos. Great review, as always! Thank you, Ameer! Glad to hear this one has caught your eye as well. It’s a nice piece. I’m leaning towards the techno over this and the dpx heat, how does this compare to those two? They are all almost the exact same price. The Techno is smaller than the HEAT and the Odino. The Techno is a great little EDC, especially if you are right handed. 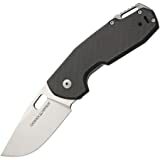 It’s not a lefty friendly knife, which is why I eventually let it go, but if you are looking for a smaller framelock folder the Techno continues to be an excellent choice. It’s smaller and more pocketable than the Odino and the HEAT. It’s a cool little knife if you want something small, but still stout and with lots of “personality”. I ended up with the odino. It’s definitely more refined than the heat or the techno. But after comparing them all I’m probably going to end up with all three. I’m a sucker for good quality, chunky little folders. Congrats on deciding on the Odino. It’s a nice little knife. I agree – I’m a sucker for these “little big knives”. That’s why I have reviewed so many. I hope you enjoy the Odino and the others if you decide to pick them up. They are all nice. Don’t sleep on the ZT900! It’s an awesome little big knife. Chris, The 900 hasn’t really been on my radar – thanks for the tip! Hi, is there a chance you can purchase blades made with different material than the n690? Mark, Not that I am aware of. I believe the Odino is only offered in N690.